Somehow it feels wrong to call this the low-end model in the Fritz!Box 7300 range, but that's what the 7330 is - low end. It's a harsh description for a piece of communication hardware this able, but it earns it due to its relative lack of features compared to its bigger brothers such as the FRITZ!Box 7360. 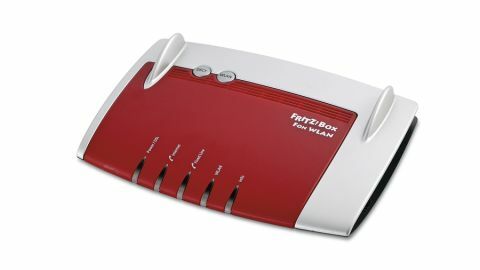 The best way to describe the Fritz!Box 7330 is as a communication hub - this is no lowly network router. Its abilities stretch to being an entry-level PBX or Private Branch Exchange to you, making this a SOHO-class bit of kit. Alongside the usual ADSL2+ modem, the 2.4GHz 300Mbps wireless and the highly versatile switch - oddly with a single Gigabit and 100BaseT LAN port - is a host of analogue, DECT, VoIP and mobile phone capabilities. You can add up to six compatible DECT phones, divert calls to mobile phones via an Android or iOS app and take calls for up to five numbers from the built-in answer machine. It's a crazy configuration that's ideal for any small office. If you're in the market for a box that can handle your DECT phones, re-route calls, offer answer-phone capabilities, automatically route VoIP calls from smartphones, deal with faxes, provide an ADSL2+ modem and be a 2.4GHz router then you're either a very busy person or an entire office. It has the same features as the rest of the 7330 range, apart from the UK-limited VDSL broadband technology. The one area AVM seems keen to cut away are the LAN ports with just two on offer and one being 100BaseT, the other is Gigabit. It's an odd mix and on a £100+ unit somewhat annoying as it could be a deal breaker for many. One area that isn't skimped over is the interface and installation, with the usual comprehensive and fast web interface ever present. It's potentially complex for the novice, but the Expert mode pleases our desire for comprehensive settings and information. Its integrated live bandwidth and frequency graphs are impressive, with it having an energy-saving section and some excellent easy-to-understand logging. We were intrigued to see if AVM had cut corners on the wireless abilities and in a way offering only 300Mbps 2.4GHz WLAN seems to do just that, but under testing it was among the fastest models we've used. The issue is whether people want the built-in telephony features over enhanced 5GHz or 450Mbps networking? Less pleasing were the dire NAS speeds with transfers struggling to make 5MB/s. Rounding things off is IPv6 routing, basic scheduling and parental controls. The lack of 450Mbps or 5GHz wireless could put off those who want the bleeding edge, but there's little support for those technologies right now. For the rest of us, the best 2.4GHz 300Mbps performance will do. We'd also expect four full Gigabit LAN ports, and the odd provision of two just isn't good enough. This 7330 almost makes more sense than the more expensive models. As the core of a communications hub it'd be ideal. It offers fast 2.4GHz speeds and there's little on the market to touch it.